Wash your veggies. Cut lengthwise and remove the seeds. Lightly brush the bell peppers with olive oil. Grill your peppers in a skillet about 4 to 5 minutes each side. Set aside and let cool. Chop the bacon and cook in a skillet until crispy, remove and place over a dish with paper towels to absorb the excess oil. In the same skillet, sauté the garlic and onion until the latter becomes translucent. Chop the scallions and the coriander; reserve. In a small bowl combine the cream cheese, salt, walnuts, pepper, lemon juice, and lemon zest, mix well. Fold in the scallions and coriander. With a small spoon stuff the peppers and place them back in the skillet on low heat to warm (about 3 minutes) or place them in a baking sheet and bake for about 10 minutes at 300°F. Transfer to a plate and serve. Variation: Omit the walnuts; use 1/2 cup (50 g, almost 2oz) shredded Cheddar or Monterrey Jack cheese. Source: Adapted from The Roasted Root and Eat, Drink and Be Merry. 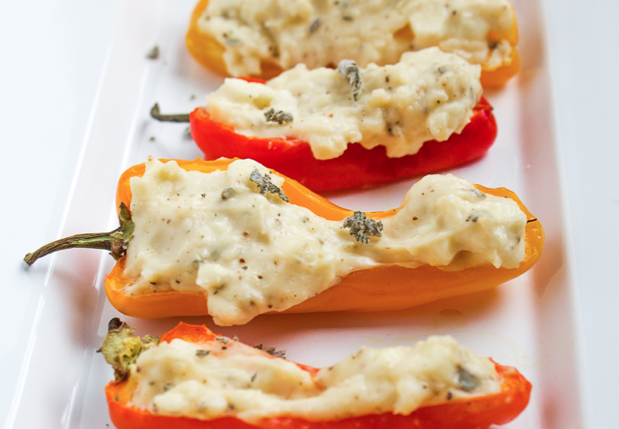 Categories: Bell Pepper, Recipes | Tags: appetizer, bacon, cream cheese | Permalink.